Playing Time: 10 - 20 min. Whether you're ready to play alone or with a group Split Second is the game for you. You'll find out just how fast your hands can be in this fun game filled with personal challenges. 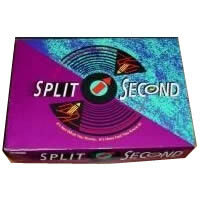 Split Second, the party game, even has games that can be played at the advanced level to keep you coming back for more. Split Second is the perfect game for you and your friends. Find out who is the fastest in this hand slapping, foot stomping game. Be sure to check out Split Second for your next party. To win the game of Split Second, your goal is to finish in the shortest amount of time. Your Split Second game should come with the electronic Split Second unit, an AC adapter and the Split Second game rules and instructions. Please keep in mind that the official Split Second party rules and instructions could be different depending on the game version you have. The rules below are some of the exact directions on how to play Split Second. Share with us your comments, funny stories, tips, advice, strategies, creative ways to play, questions about how to play, problems with the rules or anything you want about Split Second. All submissions will be reviewed within 24 hours. Click here to add your Split Second comments.